‘We are facing extinction’: Has time run out for a balanced approach to climate change? In a feature-length piece, Jade Burroughes makes the case that the clock has run out for moderate environmental policies when radical results are required. In 2012, environmental economist Mitsutsune Yamaguchi proposed a ‘balanced approach’ to climate change policy. One which remained moderately ambitious and was designed to resonate with other policy goals, by striking, for instance, a compromise between economic growth and resource management. Today, quandaries about the best way to tackle climate change are rife in the media, and framed as one of the most pressing crises facing our generation. But in political discourse, it is becoming evident that this sense of urgency has not developed fast enough nor materialised as anything more than a sideshow. This has lead to the emerging opinion among many radical activist groups that we are out of time for the ‘soft’ approaches – extreme action is our only remaining recourse. In a wave of desperation and enveloped in visions of impending doom many environmental activist groups are beginning to employ ‘respectable disruption’ tactics to make climate change and its detrimental impact an inescapable reality for a tone-deaf parliament; one requiring a radical and institutional solution. Warnings of extinction are not untenable by any measure. Current climate science is saturated with abundant warnings placing a 12 year time limit on our efforts to create a sustainable future by reigning in climate change. The goal agreed at the Paris climate summit in 2015 was to keep global temperature rise to 2°c above pre-industrial levels and as close to 1.5°c as possible. Even an increase by half a degree over these aims would significantly worsen the risk of drought, flooding, and poverty for hundreds of millions of people. The authors of a report by the UN Intergovernmental Panel on Climate Change released last month claimed that ‘urgent’ and ‘unprecedented’ changes are needed to reach these targets. A recent UN environment study reports the troubling claim that the minimal effort required to meet the 2°c quota is a tripled effort to cut emissions, while in order to meet the 1.5°c target efforts must increase five-fold. This scientific underbelly is accompanied by an entourage of overt visual indications confirming the detrimental human consequences of climate change such as burgeoning wildfires, coastal flooding, droughts and heat waves. With such overt symbols of climate change the hypothesis of extinction and impending doom is hard to overlook. 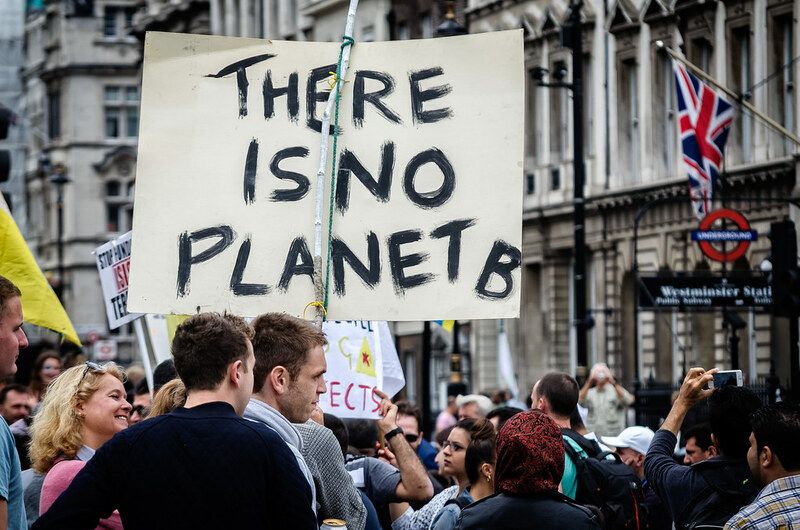 Under a banner of crisis, Extinction Rebellion recently stormed into the forefront of the media attention. Their highly disruptive, peaceful protest techniques, espousing hopes to ‘bring large parts of London to a standstill’, resulted in a number of activist arrests and attracted significant attention. Boasting an impressive social media presence and figure headed by a number of known personalities, such as YouTuber-turned-activist Jack Harries, they are making themselves and their calls for action heard. Through declaration of rebellion they hope to confront the UK government with three core demands. These include forcing government transparency about the deadly severity of our environmental situation, and instigating a WW2-scale mobilisation to enact legally-binding policies to reduce carbon emissions in the UK to net zero by 2025 under the supervision of a Citizen’s Assembly. Guardian columnist George Monbiot recently voiced his support for Extinction Rebellion, claiming that the Earth is in a ‘death spiral’ which can only be remedied by rejecting intermediate aims which, at this stage, can only be compromising to future livelihoods. Radical proposals are slowly but surely being considered a necessary substitute for the current programme of action which is half-hearted, thoroughly neglectful, and even reactionary to the other environmentally progressive measures being instituted. Undeniably, current government policy on the environment remains a patchy and mixed record. The 2015 Paris Climate Agreement appeared to mark a turning point in conversations about planetary pragmatics, where consensus was reached regarding the need to reduce emissions and shoulder the economic burden of the shift to fossil fuels. It marked potential for a future characterised by the world’s biggest cities driving sustainable policy choices in a way that rivalled the contributions of other countries, to propel progress forward with determination and brisk efficiency. As of April 2018, LSE research somewhat reassuringly indicated that of the countries to have signed the agreement (197), all have now introduced at least one national law or policy on climate change. However, in many instances government spending priorities have remained skewed in favour of commercial interest. In July 2018 it was announced that the government subsidy scheme for green energy will come to a standstill in April 2019 with no mention of a replacement – a programme that since 2010 has assisted 800,000 households in installing solar panels. Such repeals of green incentives indicate a huge setback in aims to make green energy a more appealing and competitive alternative to fossil fuels. Worse still, according to RenewableUK campaigner, Max Wakefield, this signals an ignorance to ‘the role that people and communities want to play in energy transition’. As we reach a point in time when the reality of crisis has been firmly established and the indecision of government to take radical action has been alarmingly exhibited – has the clock really run out for pursuing more intermediate goals? Gabriele Carlyle is among those who, while commending Extinction Rebellion’s mission as important, ultimately considers their aims and methods too vague and ‘utopian’ due to their radical nature. She expresses concern about the absence of intermediate stepping stones in securing the big 3 demands and is sceptical whether the big demands can be secured without compromises. Further, some argue that a gentle easing into environmentally-beneficial practises should be practised for the sake of acclimatising individuals – this is seen in proposed incentives to reduce the carbon footprint of the meat industry by changing our eating habits. By becoming flexitarian and reducing your consumption of animal protein by just half – you can cut your diet’s carbon footprint by more than 40% – this is no demand to ‘become vegan overnight, but rather to moderate our [meat] consumption’. Such changes on an individual level will not ‘solve’ climate change alone, but many experts concede these lifestyle changes can influence others to follow suit. Community-based work and individuals asserting their dual rights as citizens and consumers is vital in pressuring industries and the government into implementing more widespread system-based changes. Recently, we have seen the emergence of socially conscious companies such as WE Work who in 2018 banned meat across its organisation – a deft utilisation of its economic hold over employees that cries out to be implemented on a mass scale across companies and government alike. The results speak for themselves: based on a five year projection of employee and member growth, the company says their directive will save 15,507,103 animals and 16.6 million gallons of water. Furthermore, a more balanced approach to climate change doesn’t necessarily exclude the possibility of effective and radical environmental progress either. According to Hal Harvey, developer of an Energy Policy Simulator in 2014, the top 20 carbon emitting countries in the world (as of 2014) were responsible for 80% of the global emissions. Hence, there is no need to lure all countries into a globally unanimous agreement as past policy under the UNFCCC has tended towards, but instead merely attempt to implement beneficial policies in the top carbon emitting countries. The overall message is that ‘climate policy doesn’t have to mean doing everything possible, everywhere possible’- it is instead about smart and concentrated policy. How far this theoretical model could be actualised in practise is unknown. Undoubtedly, the effectiveness of such a proposal would ultimately depend on the political will of those 20 countries in question. Politics remains, according to the IPCC, the biggest challenge to climate progress. With just 12 years remaining to make significant progress in cutting carbon emissions, it becomes more vital than ever to approach the environment with the right corrective methods. Balanced approaches should not be completely dismissed. But the tendency to subordinate environmental policy to commercial interest has become untenable given the strict time frame left to us. Intermediate and soft lifestyle choices such as switching eating habits, recycling and use of public transport must be accompanied by radical and influential policy shifts in government. The IPCC concludes that “unprecedented changes” are required in all aspects of society to deal with climate change. But how do we make the government act? While the mobilised civil disobedience of Extinction Rebellion is giving necessary publicity to the disaster we are facing, this technique may not be wholly effective. Chris Saltmarch sombrely claims that ‘the forces of fossil capital and their government representatives act irrespective of public opinion. They value social license to operate, but don’t depend on it’. However, individuals can certainly hold politicians to account by supporting parties that put the environment at the heart of their economic and industrial agendas. Labour have spearheaded this with the claim that if they came to power, they would keep the solar energy subsidy scheme alive by using a portion of the £557m clean energy subsidy pot. In a political landscape where questions of climate change still take a second seat to economic considerations, such initiatives that buck the trend may well provide the foundation for radical action tempered by compromise that many are hoping for. Despite the contested success of Extinction Rebellion’s aims, their ethos, summarised neatly by George Monbiot, should remain pertinent. We should ‘not allow those who have caused this crisis to define the limits of political action… those whose magical thinking got us into this mess to tell us what can and cannot be done’. The government’s hand must be forced, and such civil disobedience tackles the hardest part of this necessary move towards more radical approaches to the environmental crisis – ensuring its severity and magnitude is made known on a public platform.